In this installment: 10-seed Xavier (23-12) vs. 3-seed Baylor (29-7). In Thursday’s post, Cincinnati, Ohio, took a win in this category by virtue of going up against Columbus, Ohio. Today, Cincinnati is back, this time representing Xavier, and it has another pretty light opponent in Waco, Texas. I have never been to either place, but a quick Google search of “worst college towns” turned up Waco over and over and over again. So, in perhaps the biggest upset of the season, Cincinnati now has two wins in the “Better College Town” category. Don’t shoot the messenger. Xavier’s Chris Mack is one of the younger coaches in the Sweet 16 at 42, and he’s only in his third year with the Musketeers. In that time, he’s compiled a 70-28 record, twice made the Sweet 16, and won two A-10 regular-season championships. By the way, check out the four Xavier coaches who came before Mack: Sean Miller, Thad Matta, Skip Prosser, Pete Gillen. All went on to bigger schools and had at least some success. Somebody in the Xavier athletic department has a keen eye. Baylor, of course, is led by Scott Drew, the preacher-looking, wheeling and dealing son of a gun. He’s done a great job building Baylor from the ashes of the Dave Bliss-era scandal, and the Bears are now a national powerhouse. On the way, however, he’s drawn a few sideways looks for his recruiting practices, and earned the ire of Bobby Knight and Rick Barnes. He’s a complicated man, that Drew, but everything good comes with a price. This is only his third NCAA tournament with Baylor, and he doesn’t have any Big 12 regular-season or tournament titles, but he did make the Elite Eight in 2010 before losing to Duke. This is a tough call; Miller Mack has had more immediate success and owns a better win percentage, but Drew has been through the mud and come out smiling on the other side. I’m giving Baylor the point by a nose. The Musketeer and the Bear are both great mascots (and also natural enemies), so this one comes down to colors. 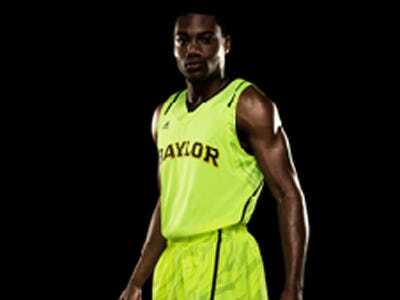 Normally — NORMALLY — Baylor’s rich dark green would win in a landslide over Xavier’s less evocative dark blue. 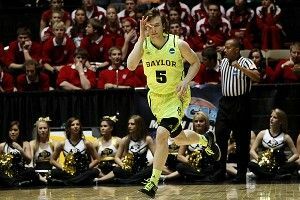 However, have you seen the highlighter atrocities that Baylor wears now? I guess they were trying to be the next Oregon football, drawing the hearts and minds of the youth with snappy green unis, but boy, did it fail. I’m officially banning them from winning this category for the next five years. Let’s start it out with Xavier’s Tu Holloway, the 6-foot senior dynamo averaging 17.4 points and 4.9 assists per game as a point guard. He scored 25 in a narrow first-round win over Notre Dame, and 21 more against Lehigh in round two. Xavier is statistically the second-weakest team left in the tournament, after Ohio, and any chance it has to advance deeper depends on Holloway. A 10-for-15-type game like he had against Notre Dame gives the Musketeers a good shot, while a 5-for-13 performance, like his effort in a loss to St. Bonaventure in the A-10 championship game, dooms them to a loss. Pretty basic stuff. He’s not alone — 6-foot-1 Mark Lyons averages 15 a game and can shoot the 3, while Dezmine Wells and 7-foot Kenny Frease are the leading rebounders, and average near 10 per game — but he’s alone enough that Xavier can’t win without him. Baylor is one of the 10 most talented teams in the country. The triple giants — Perry Jones III, Quincy Miller, and Quincy Acy — are well publicized, but it might surprise you to know that 5-foot-10 junior guard Pierre Jackson is the leading scorer with 13.5 points per game and a 41.9 percent mark from deep. He also averages almost six assists per game, and you could argue that his performance from 3 is the most important element to Baylor’s ultimate success. In the Bears’ seven losses this season, he shot just 35 percent, six points off his season average, which was the same percentage Brady Heslip shot in those same games, 10 points lower than his season average of 45 percent. When Jackson and Heslip are shooting well, Baylor is nearly impossible to beat, but when the three big men have to do all the work themselves, they’re very defensible. Lastly, and maybe most importantly, I think we’ll see a lot of A.J. Walton, Baylor’s top perimeter defender who usually comes off the bench. He’s the man who will match up with Holloway at least some of the time, and if he does his job, Baylor could coast. The talent overload of the Bears gives them the point here. Any time a team plays predominantly zone, that seems to dominate the discussion, and here we are again. It’s interesting to compare Baylor’s zone to the one employed by Syracuse, because while the Orange’s is more efficient and effective, Baylor allows fewer offensive rebounds, a common zone hazard that can become a really big deal in the tournament. It’s easy to track the change in that department; in their first two losses of the season, back-to-back against Kansas and Missouri, Baylor gave up 15 and 12 offensive boards, respectively. When they met those teams again less than a month later, they gave up just seven and six … and lost both games again. The Bears kept the percentages lower for the rest of the season, and even got over the Kansas hurdle in the Big 12 tournament before losing to Missouri for a third time. Xavier is mediocre at best on the offensive glass (184th nationally), so that element shouldn’t factor in as much as it might against a normal zone defense. And with such a drastic height advantage, it wouldn’t surprise me to see Drew use more man-to-man than usual in an effort to contain Holloway and keep him and Lyons from finding open spaces on the perimeter. Again, this is where I expect A.J. Walton to play a big part. The biggest concern for Xavier, though, is giving Baylor second chances on the offensive glass. Aside from Frease, the 7-footer, they’ll be seriously outsized down low, and while the Musketeers have done a semi-decent job of offensive rebounding all season, Baylor is the 16th-best offensive rebounding team in the country. They do a great job keeping opponents’ effective field goal percentage low, and an even better job defending the 3, but it could all go for naught if Baylor has too many bonus opportunities. Foul trouble for Andre Walker or Frease would spell disaster. It’s been an up-and-down year for Baylor after a 17-0 start, but they should have a little confidence after finally beating Kansas in the Big 12 tourney. The two tournament wins, against South Dakota State and Colorado, are pretty unimpressive, but late wins against Texas and Kansas State show they have been playing well. CrashingTheDance made a neat graphic showing the net efficiency margin of teams in each region, and as you see in the first graph on that page, Baylor has been playing the most efficient basketball of any South Region team lately. They dipped a little in late January and early February, but seem to be peaking at the right time. Xavier finished its season by losing five of 11, albeit to very good teams, and though the Notre Dame win was a definite feather in the Musketeer cap, getting Lehigh in round two was a huge break. Not much mojo to be found here. In this case, I think the KenPom numbers are telling the truth — Baylor is a superior squad. With dominance in the paint, it’s only going to take average shooting games from Jackson and Heslip to put Xavier away. Tu Holloway is an excellent player, but with the Miller/Acy/Jones trio clogging the inside, it might not even matter if he goes for 30. I’d love to see Xavier keep it close, but I like Baylor by about 15.